I’m abetting the Criminal Element again, this time with a consideration of the USA Network series Colony. Alien invasio ns on the big and small screens have rarely been about aliens. They’re usually metaphors for whatever the scare-of-the-year happens to be: Nazis, communism, religion, lack of religion, race, colonialism, etc. Today’s scare-of-the-decade is terrorism and our response to it. What’s the difference between a terrorist and a freedom fighter? What’s the difference between proactive policing and oppression? Can a tyrant’s collaborator have good motives? Can a self-proclaimed “freedom fighter” have bad ones? Whose point-of-view gets to control the narrative? 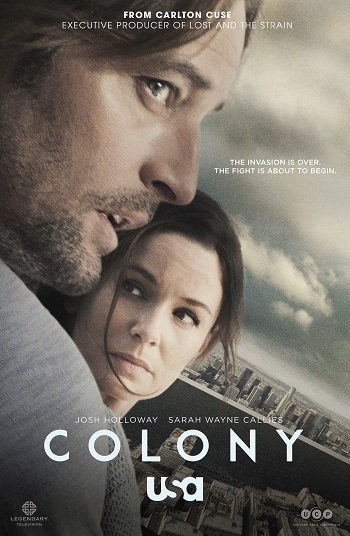 An alien invasion makes it safe to ask all these questions in Colony, a USA Network series created by Carlton Cuse (Lost) and Ryan Condal (Hercules).